Audio Video Bridging (AVB), which was introduced in 2011 as a standards-based networking protocol, has added a new chapter, announcing Milan, the latest iteration of the protocol. 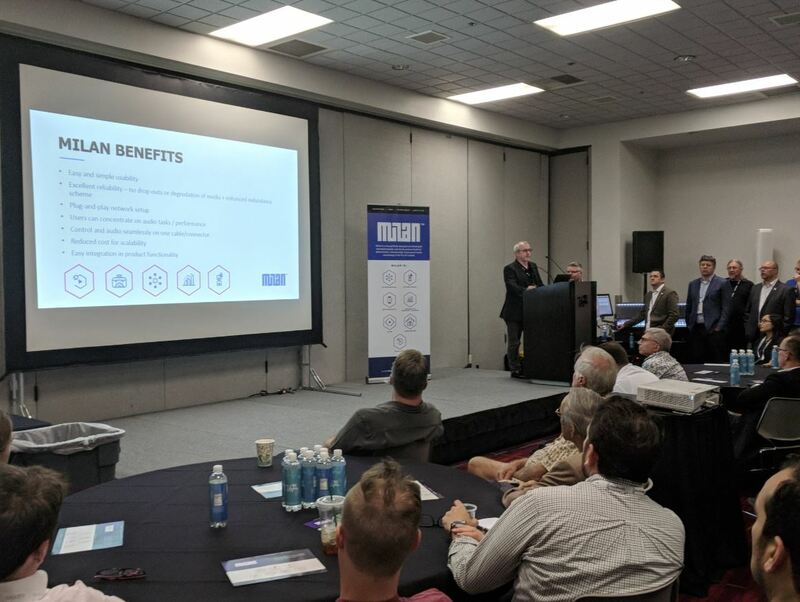 The announcement, made at a press conference hosted by the Avnu Alliance, AVB’s marketing organization, yesterday during the InfoComm 2018 Show, emphasized a significant cohort of new supporters for the protocol, including d&b audiotechnik, L-Acoustics, and Meyer Sound — three leading sound-reinforcement–systems manufacturers, all with broad representation in sports-venue sound — as well as AudioScience, Avid, Biamp, and Luminex. Henning Kaltheuner of d&b audiotechnik discussed the Milan AVB initiative launched at InfoComm 2018 in Las Vegas. Like AVB, Milan offers the technical benefits of the IEEE AVB open-standards approach, such as time synchronization and guaranteed quality of service, as well as risk-free coexistence of control and media data on one network. Networking is critical to development of improved sound for both live and broadcast sports. It drastically reduces cabling requirements, putting hundreds of channels onto a few category-type wires, thereby reducing costs and complexity. Networked audio also helps sports venues become more flexible for uses besides sports events, thus supporting their ROI requirements. Milan will assume the device-certification duties for AVB, a process that has been plagued by a lack of integration between AVB proponents and a complex certification regimen. Its proponents acknowledged as much at the press event. Jeff Rocha, director, product management, L-Acoustics, went deeper into that issue. “AVB is a better solution for end users, but we recognize that the challenge to end users is an application-layer solution on top of AVB that wasn’t providing sufficient interoperability,” he explained. “That was the reason that Dante got so much traction [in the audio-networking market]. That’s leading users to use a nice application layer but one built upon a risky foundation,” a reference to Dante’s use of Ethernet as a base format versus AVB’s reliance on IEEE-based open standards. Rocha and others promised a “more streamlined” process for device certification, although they wouldn’t commit to a time frame for new-device announcements. Milan is short for “media-integrated local-area network.” Nomenclature has been a running theme in audio-network development: Audinate’s proprietary Dante networking system is needled by the competing Europe-based Ravenna protocol’s being named after the city in Italy where poet Dante Alighieri is buried. A spokesperson for the Avnu Alliance told SVG the name Milan was purely coincidental. Rocha and others emphasized that Milan and AVB are being promulgated by a consortium of competitors brought together by what they see as a superior networking format that will provide new momentum for the AVB format.